This week I learned about the Balkan War from one of my fellow student’s father. I will teach you what he taught us. There used to be a country called Yugoslavia. It consisted of a few countries. The ones I’ll be talking about today are Bosnia, Croatia, and Serbia. Let’s get our geography down real quick. Croatia is yellow, Bosnia is green, and Serbia is brown/pink/redish color. As you can see from this map, Bosnia is practically surrounded by those two countries. If you look closely, only a TINY part of southern Bosnia is touching the shore, and that’s it. On March 31st, 1991, Croatia wanted to secede and become its own country. Serbia didn’t like this, and they tried to stop Croatia from leaving Yugoslavia. 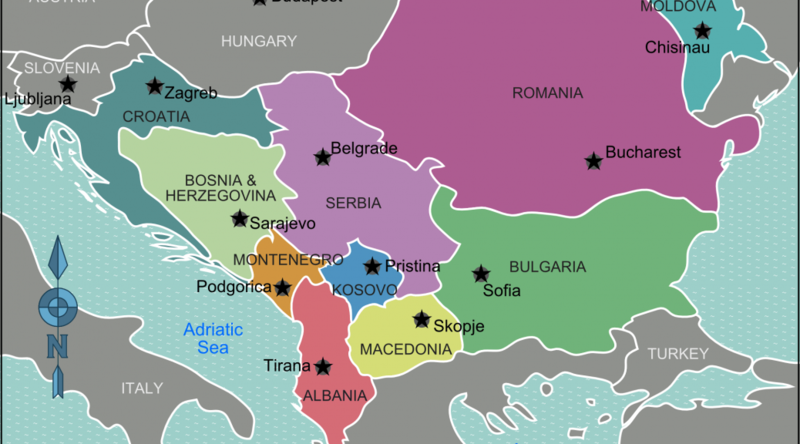 This started a conflict between the two states, leaving Bosnia in the middle. Bosnia declared that they also wanted to secede on April 6th, 1992. Serbia obviously didn’t like that either. So now Serbia was in a war with both Bosnia and Croatia. Because Bosnia was left in the middle, that’s where the fighting happened. The innocent citizens, who were just trying to live, were stuck in the middle of a horrible war. There are many similarities between the Holocaust and the Balkan War. There were concentration camps, pointless killings of civilians, and sieges that killed thousands of people. The army would go around to people’s houses and take the able bodied males to fight in the war. They didn’t have a choice. When people were lucky enough to escape to other countries as refugees, they would get on buses. The even luckier ones would be delivered safely to another country. The unlucky ones would be separated into groups of men, women, and children. Then lined up and shot. Just like that. My friend’s father was 6 when he escaped from Bosnia to Croatia. The bus that transported him and his family to safety did stop. The men, women, and children were separated and lined up. But just a few seconds before the shots rang out a UN vehicle showed up and their lives were saved. He and his family made it safely to Croatia and lived on an island in a refugee camp for 2 1/2 years before coming to the USA as an immigrant. He had a friend in less than a week, and learned the language in 6 months. He’s now married and has an 8 year old daughter named Ari. She’s the age he was when he was still living in a refugee camp. He was going to a soup kitchen every day to get food with his family. Without refugees being welcomed by Croatia, and immigrants being welcomed by the USA, Ari wouldn’t exist. Our school wouldn’t be as happy as it is today, all because of one immigrant. I guess some people fail to realize how important refugees and immigrants are, and that’s too bad. I think if they took the time to meet one, they would learn that they’re people just like you and me, and that when they need help we should help them. His story made me think about how very lucky I am to be living where, when, and how I am now. Thank you for this summary @alonalearning !!! I really learned a lot from Armin’s talk and I’m so glad you blogged about it to help, and maybe others remember what we learned. Hearing the stories of others certainly helps put our own lives in perspective. Very well written. So glad to be able to share my story for you guys. Keep up the great work! Love this summary, @alonalearning. I wish I had been there, but now I know. Smiles and appreciation to you.